The Millstream Falls (Aboriginal: Yindinji), a tiered plunge waterfall on The Millstream, is located in the UNESCO World Heritage–listed Wet Tropics in the Far North region of Queensland, Australia. The Millstream Falls are situated approximately 15 kilometres (9.3 mi) southwest of Ravenshoe, on the Atherton Tableland and are accessible by road from the Kennedy Highway. The falls are protected within the Millstream Falls National Park. The falls comprise two sets of falls, Big Millstream Falls and Little Millstream Falls, both located on the same watercourse, situated approximately 500 metres (1,600 ft) apart. The larger of the two falls is reputably the widest single-drop waterfall in Australia. ^ "Millstream Falls (QLD)". Gazetteer of Australia online. Geoscience Australia, Australian Government. ^ "The Millstream Falls (QLD)". Gazetteer of Australia online. Geoscience Australia, Australian Government. ^ a b "Millstream Falls (entry 39749)". Queensland Place Names. Queensland Government. Retrieved 13 September 2015. ^ "The Millstream Falls (entry 34024)". Queensland Place Names. Queensland Government. Retrieved 13 September 2015. ^ "Millstream Falls". World of Waterfalls. Johnny T. Cheng. 18 May 2008. Retrieved 29 May 2014. ^ "Little Millstream Falls". World of Waterfalls. Johnny T. Cheng. 18 May 2008. Retrieved 29 May 2014. ^ "Millstream Falls National Park". BIG4 Atherton Woodlands Tourist Park. 2009. Retrieved 29 May 2014. ^ Emerson, Maree (4 December 2007). "Cool waters of the Cairns highlands". The Cairns Post. News Limited. Archived from the original on 23 October 2009. Retrieved 16 May 2010. "Tablelands Region : Visitor guide" (PDF). Department of National Parks, Recreation, Sport and Racing (PDF). Government of Queensland. 5 November 2012. Archived from the original (PDF) on 13 February 2014. "Millstream Falls. Australia's Widest waterfall when in full flood". Getaway Guide (photo). Barrier Reef Australia. 2011. This waterfall-related article is a stub. You can help Wikipedia by expanding it. 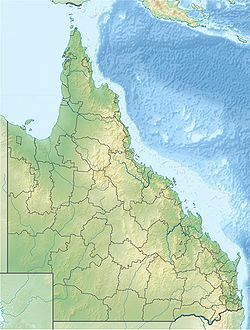 This Far North Queensland geography article is a stub. You can help Wikipedia by expanding it. This page was last edited on 25 January 2018, at 08:02 (UTC).